Some might wonder why a pilot needs a good wristwatch since their duty is to successfully fly and land the plane from and to a destination. Well, whatever your thoughts are, pilots do need an IWC Big Pilot watch and a good one too. There are several companies that have made a name manufacturing elegantly designed and precision time telling wristwatches for pilots over the years, but the International Watch Company is among the first brands of watchmakers to produce a luxury series of watches to suit the gentleman nature of a pilot. Traveling back memory lane, the IWC came to be in 1930 creating watches that have kept pilot in their cockpits on time for every departure. However, the IWC’s big pilot is the perfect example of craftsmanship meets originality and style for a pilot or any in the aviation industry. 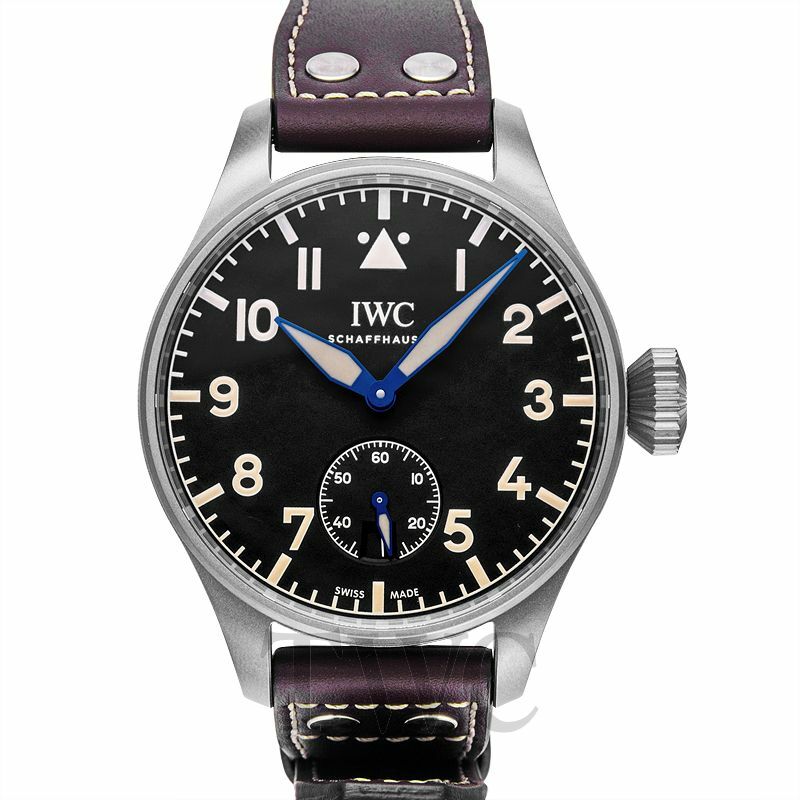 Indeed the IWC has transformed the watch industry and had trainee pilots, commercial pilots, private planes and military mavericks rocking this modern classic at every flight. The pilot chronograph is a watch with a story to tell and after some evolution – the addition of the stopwatch function, the pilot Chronograph is one of IWC practical watches for pilots that love keeping to scheduled flights or otherwise. The Pilot Chronograph watch features a day and date function at the 3 o’clock position with other dials located on the 6, 9 and 12 points on the watch. Another lovely feature is the hacking second hand that allows you to sync your watch with another IWC brand watch. A combination of steel and calfskin leather body, the chronograph has a triangle shape for 12 and bold legible numerals.The 43mm case is 15.2 mm thick and can resistant to water for about 60 minutes. Like all IWC pilots, it has sapphire glass and a slightly elevated crystal surface with a reflective coating on both sides. The Pilot Chronograph runs on a 25 jewel IWC having an over 40-hour power reserve and a 79320-mechanical movement with 28800 beats VpH. Named after the French poet, aviator, and author, the IWC big pilot Le Petit Prince is a watch that has all the characteristic of the IWC pilot chronograph watches. The most obvious feature of this watch is the sparkling blue interior which compliments and contrasts the stainless-steel body including the operating pin; with a well-sewn leather strap; the IWC Petit many sound small by the name but this watch is bold and wearing one is wearing a piece of history in all its glory. 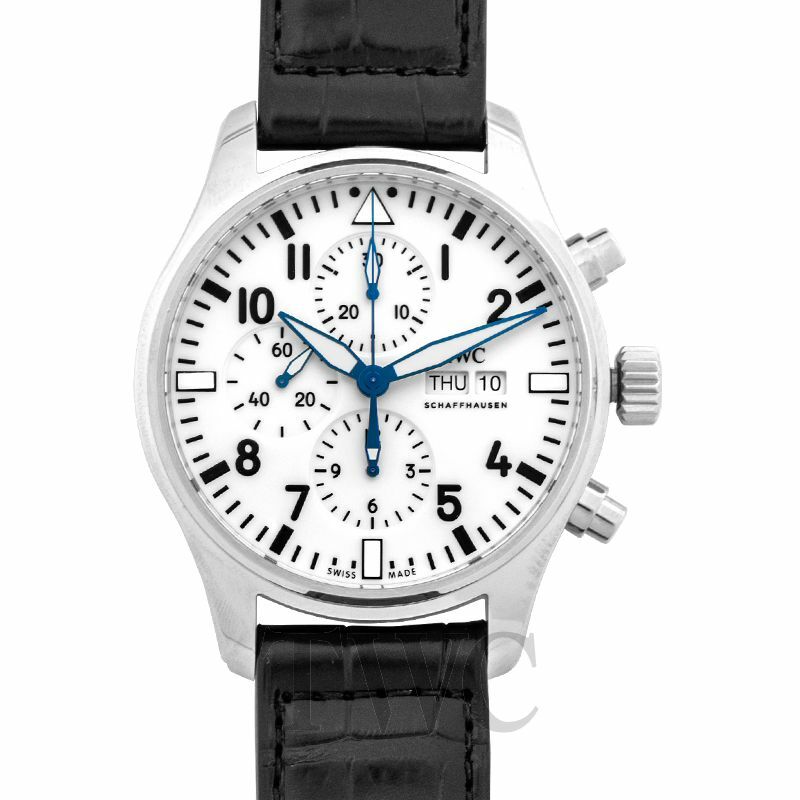 The IWC Petit is a chronograph watch and has all the features of the watched in the series. Well, with all the hype from the manufacturer, the IWC certainly didn’t fail to deliver big on this watch with the exotic visual features with –an unbelievable 192 hours of power reserve- this is a first for a wristwatch- this will ensure that your watch never stops working efficiently for a period of 8 days with no compromise on precision time telling. As usual, the watch has the signature diamond shape knob with stainless steel edges and brown leather strap with bold numerals and a blue and white triangle shape minute and hour hand. This is a good representation of the typical all-American military style wristwatch but as usual retains all the main features of all IWC brand wristwatch – the triangle at 12 o’clock, the diamond shape knob and the unique hour and minute hand. Before we get into the features that make the Top gun start out, just remember that this IWC pilot watch is expensive but worth the huge price tag. The casing is a 48mm round surface watch made of Zirconium oxide for durability, and it is scratch resistant features; it is also resistant to acids and basic water/air corrosion, hence the price. The reasons we love the Top Gun are more than the American feel is the grade 5 titanium base with a black matte finish and black textile strap. 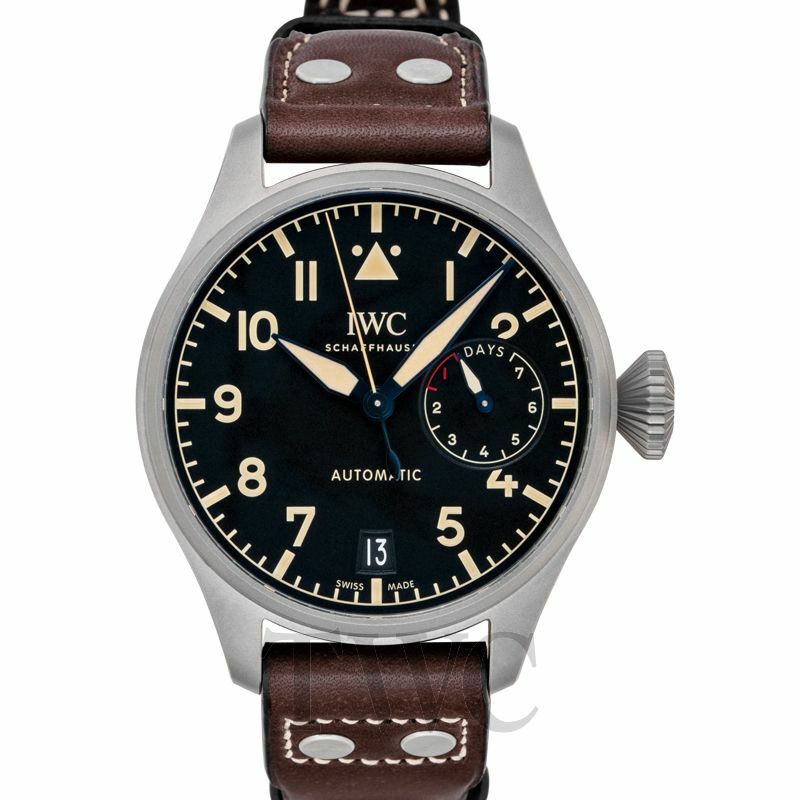 The IWC Spitfire is another overhaul wristwatch that is will capture your heart if you are looking for a unique and interesting watch; the IWC Spitfire is one that will offer you style and pizzazz distinct among other Pilot watches. The distinct feature of the Big Pilot Spitfire is the unique color combination unlike other IWC watches; this particular watch comes in an envy green insert with bronze exterior unlike the stainless-steel body branded in other watches. The Spitfire is a 46.2mm with a 72 hours power reserve with an impressive seven-day calendar that is adjusted from the bronze colored diamond shaped crown and according to the manufacturer; it will stay precise for 577.5 years which is more than enough time for a watch. To the watch that gives IWC its recognition, the Big Pilot Watch is an impressive piece of machinery worth every penny spent. The Big Pilot is a true character watch with the basic signature of the IWC – the stainless-steel edge, the leather strap, the bold numerals and of course the diamond shaped knob. The watch is a 43mm wide surface and 16mm thick casing that can last 60 minutes in 200 ft of water with a starch resistant surface and a two-year warranty. Wristwatches are man’s best accessory and even more so for a pilot. The IWC has been making wristwatches since forever with pilots and flying enthusiast rocking their unique designs to date. Furthermore, their wristwatches are pretty expensive, but with excellent features unlike none other, it is worth it. The Big Pilot is not for the faint-hearted, but it will definitely stand out in a crowd – or in the air- the IWC Big Pilot is the aviation watch to beat in uniqueness, design, craftsmanship, and elegance.